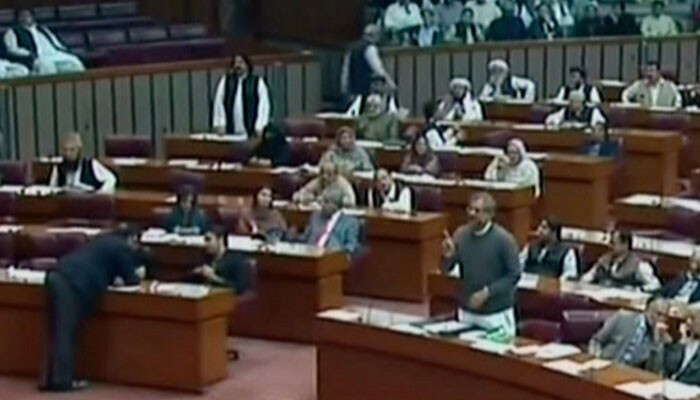 ISLAMABAD: Information Minister Fawad Chaudhry on Friday criticised a privilege motion by the opposition in the National Assembly, calling it an “attempt to influence” an ongoing investigation by the National Accountability Bureau (NAB). DG NAB Lahore Saleem Shehzad appeared on Geo News' show 'Aaj Shahzeb Khanzada Kay Sath' on Thursday night, where he said that the anti-corruption watchdog would file a reference against Opposition Leader in National Assembly Shehbaz Sharif by the end of this month. The official also accused Shehbaz's son-in-law Ali Imran of depositing official cheques in his personal account. Citing a breach of the privilege of the members of the opposition in the National Assembly, the opposition leaders submitted a motion which objected to the “media trial” of the opposition members and urged “immediate intervention” of the House. However, the information minister asserted, “The motion is an attempt to influence the investigation." “MNAs cannot be treated differently than common people,” he added. The opposition's privilege motion submitted earlier today had stated, “Mr Saleem Shehzad, DG NAB Lahore with the consent of the Chairman NAB has appeared on the following TV programs of which the documentary evidence is available,” reads the motion, listing a number of TV programs which interviewed the NAB official. The Pakistan Peoples Party (PPP) supported the motion submitted by PML-N. PPP leader Naveed Qamar said, "If we allow media trials now then the process will continue. Today, it is PML-N leaders and tomorrow it will be someone else."